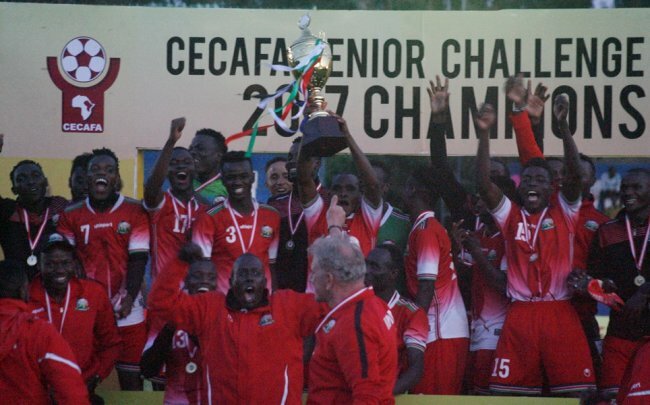 Patrick Matasi, the Harambee Stars goalkeeper saved three spot kicks as Kenya won the CECAFA Senior Challenge Cup with a 3-2 post-match penalties win over Zanzibar in Machakos on Sunday. The game was forced into penalties after a 2-2 stalemate in 120 minutes. The shot-stopper saved from Adeyum Ahmed Seif, brace goal scorer Khamis Mussa Makame and Mohammed Issa Juma. Feisal Salum Abdallah and Mudathir Yahya scored Zanzibar’s spot kicks. Kenya’s penalties were scored by Jockins Atudo, Wesley Onguso and Samuel Onyango while Duncan Otieno saw his effort saved. 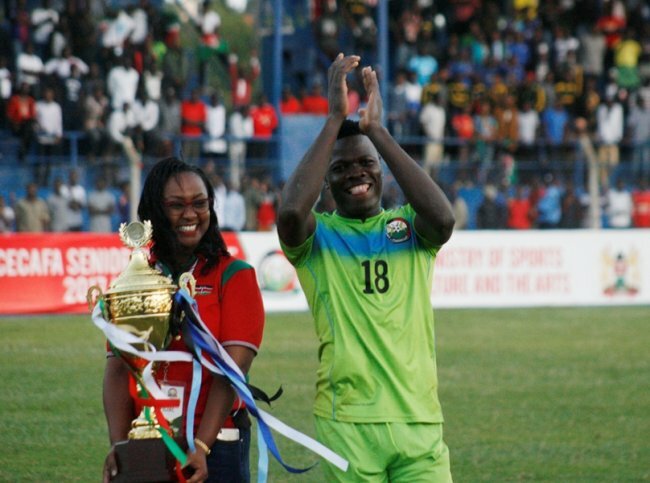 Matasi was deservedly named the goalkeeper of the tournament with the two goals he conceded in the final being his first of the tournament. He was also named the tournament Most valuable Player. “I am very pleased with these two awards, but they are not my own. I dedicate these to my teammates and all the Kenyans who turned out to support us. I motivated myself for the penalties and after we conceded the second goal, I told the players not to worry, I would do my thing and ensure we win,” an elated Matasi said after the match. Paul Put was equally elated having won the title on his maiden attempt, barely three weeks after his appointment. He lauded the players for the effort, but was left a bit disappointed with the manner they threw away the lead twice. “I think in a more ideal situation, we would have avoided those two goals. But anyway I am proud of the players, that’s how football is sometimes. This is a good foundation and hopefully we can build on it,” the coach said. Zanzibar were left broken hearted with the result, but coach Suleiman Hemed says they have picked up vital lessons. He also hopes their performance will push further their bid to be recognized as full CAF/FIFA members. The islanders had twice come from behind in regular and extra time, but were not lucky from the penalties. Substitute Khamis Mussa Makame twice hit for Zanzibar, first in the 88th minute while his second came in the 100th minute. Ovella Ochieng’s well taken freekick gave Kenya an eighth minute lead before Khamis equalized with two minutes left. Massoud Juma then restored Kenya’s advantage in the 98th minute but the same lasted for only two minutes before Khamis struck again. Ovella broke the deadlock after eight minutes, curling a freekick round the wall after Whyvonne Isuza Abdul Aziz Makame. Zanzibar’s day was to turn from bad to worse when Makame, arguably their best player in the tournament was stretchered out injured after 24 minutes. His place was taken up by 18-year old Feisal Salum Abdallah. Zanzibar slowly crept back into the game as Kenya never made any meaningful attack since their goal. Feisal who had started all Zanzibar games prior to the final was instrumental, filling up the shoes of Makame. He won possession, distributed the ball and was ever present in midfield. However, an astute Kenyan defense marshaled by Jockins Atudo stood tall. Zanzibar’s first chance at goal came five minutes from halftime when leftback Hajji Mwinyi curled a freekick from the edge of the box which went over. Two minutes from later Seif Abdallah wasted a glorious opportunity when Suleiman Khamis’s cross from the left found him unmarked at the far post but his header went straight to Matasi. In the second half, Zanzibar came back a stronger outfit and they pushed the hosts into defending deep in their own half. In the 51st minute, Mudathir Yahya had an attempt from a freekick 25 yards out but it flew over. The hosts were pressed into their own half and the pressure finally bore fruit with two minutes left on the clock. Mwinyi Hajji won the ball on the left before slicing in a low cross that was simply tapped home by Khamis. The game was forced into extra time. Eight minutes on, Massoud who had come on as a second half substitute despite still carrying an injury took Kenya 2-1 up. 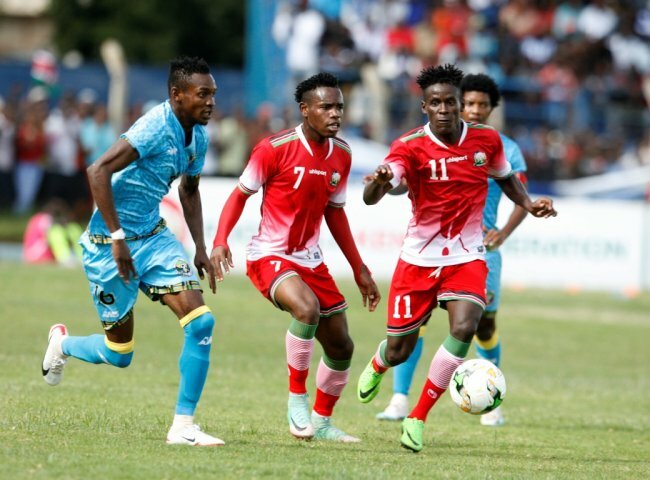 Zanzibar keeper Mohammed Abdulrahman took an awry goal-kick which Massoud won and raced into the box before shooting past the keeper one on one to send the fully packed Kenyatta stadium into frenzy. But the joy was short-lived. An error at the back from skipper Musa Mohammed whose attempt at clearing Suleiman Kassim’s cross from the right went awry saw Khamis pick the ball and slam it past Matasi. Zanzibar, knowing they were better off heading to penalties than attempting an all out attack stuck to defensive duties and successfully safeguarded the 2-2 score-line. Kenya line-up: Patrick Matasi, Musa Mohamed, Jockins Atudo, Dennis Shikayi, Wesley Onguso, Pattillah Omotto, Whyvonne Isuza, Ovella Ochieng,( Ernest Wendo) Duncan Otieno, George Odhiambo,(Samwel Onyango) Kepha Aswani(Massoud Juma). Unused Subs: Boniface Oluoch, Gabriel Andika, Said Tsuma, Bernard Ochieng, Wellington Ochieng, Isaac Kipyegon, Vincent Oburu, Chrispin Oduor. Zanzibar line-up: Mohammed Abdulrahman, Ibrahim Said, Mwinyi Haji, Abdulla Salum Kheri, Issa Haidar Dau, Abdul Aziz Makame (Feisal Salum Abdallah), Mohammed Issa Juma, Seif Abdallah, Mudathir Yahya, Ibrahim Hamad Ahmada (Khamis Mussa Makame), Suleiman Kassim (Adeyum Ahmed Seif). Unused subs: Ahmed Salim, Nassor Mrisho, Ibrahim Abdalla, Hamad Makame, Abdul Samad Kassim, Mohammed Mmanga, Suleiman Mohammed, Abdallah Hajji.